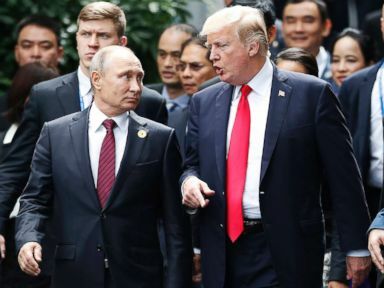 A bipartisan majority of Americans in a new ABC News/Washington Post poll supports tougher sanctions on Russia in response to its alleged international misbehavior. Yet for half, a chitchat at the White House couldn’t hurt, either. With additional sanctions looming, 68 percent support tougher U.S. measures against Russia, four in 10 strongly so. That view spans partisan groups, a rarity in today’s political climate, including 74 percent of Democrats, and 68 percent of Republicans and independents alike. 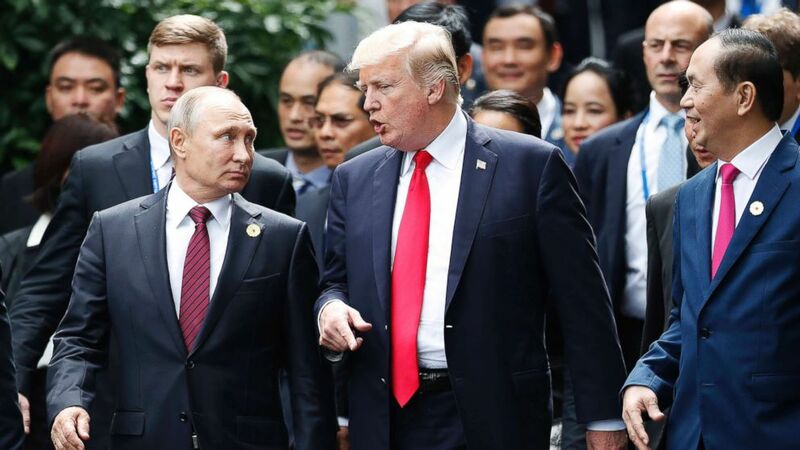 Even with support for sanctions, 52 percent favor U.S. President Donald Trump holding a summit with Russian President Vladimir Putin at the White House to try to improve U.S.-Russia relations; 42 percent oppose it on the grounds that doing do so would legitimize alleged international lawbreaking. 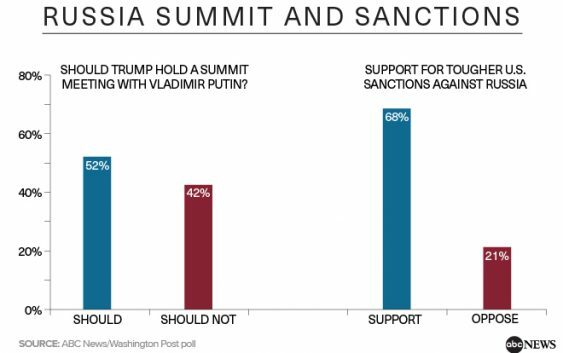 The public sees no contradiction in these views; among those who support a summit, 65 percent favor tougher sanctions as well. The results on both countries underscore a longstanding public preference for talking rather than fighting between nations. Indeed, six in 10 oppose Trump threatening military action against Pyongyang. 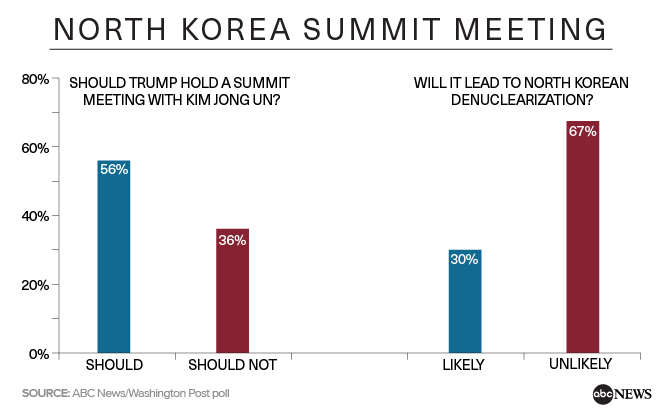 It’s also notable that most support a summit with Kim even though, in an ABC/Post poll last fall, just 32 percent trusted Trump to act responsibly in dealing with North Korea. In January, 52 percent expressed concern Trump would launch an unjustified nuclear attack; surely talks are preferable. 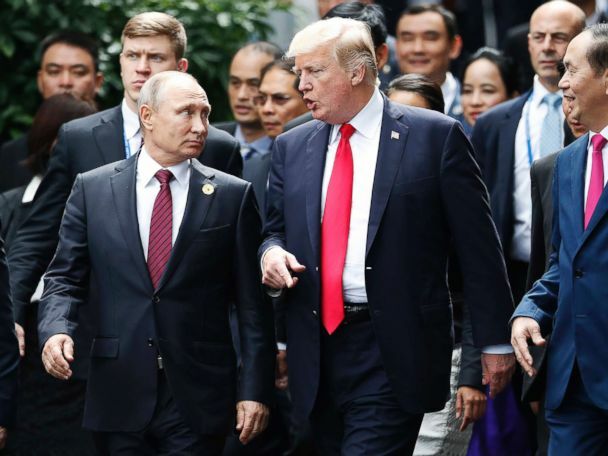 In another result on Russia, 49 percent say Trump has done too little to criticize Moscow, exceeding the 38 percent who say he’s handled it about right. (Just 4 percent say he’s criticized it too much.) The survey was conducted Sunday through Wednesday, before the U.S.-led airstrikes on Syria. In announcing them, Trump challenged Russia for supporting the Assad regime. There are partisan and ideological gaps on a meeting with Kim, as well; it’s supported by 70 percent of Republicans and conservatives, 56 and 57 percent of independents and moderates, and 46 and 40 percent of Democrats and liberals. Support for both mooted meetings is significantly higher among more pro-Trump groups, including more men than women, more whites than nonwhites and more rural dwellers than people in cities or suburbs. Support for a summit with Kim is higher among seniors than young adults. 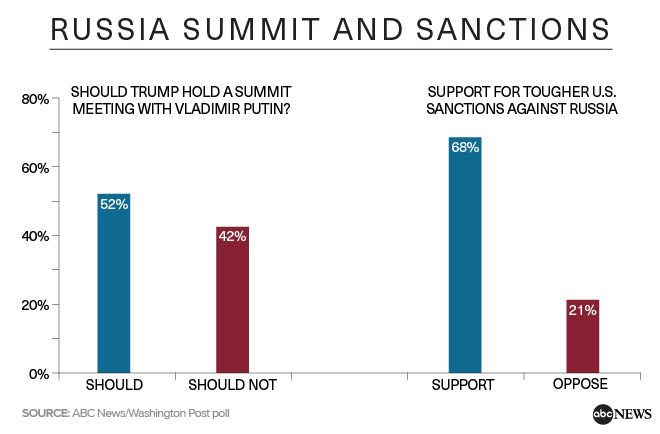 While broadly based, support for tougher sanctions against Russia is 17 points higher among college graduates than noncollege graduates and 18 points higher among seniors than young adults, whose support for sanctions, at 56 percent, is the lowest of any demographic group. The survey was produced for ABC News by Langer Research Associates of New York, New York, with sampling, data collection and tabulation by Abt Associates of Rockville, Maryland. See details on the survey’s methodology here.